The Old Farmhouse is a traditional stone farm cottage with a modern kitchen extension. 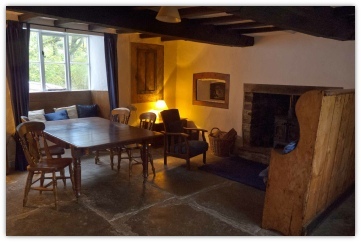 The living room has a traditional slate floor, low wooden beams and an upgraded wood-burning stove. 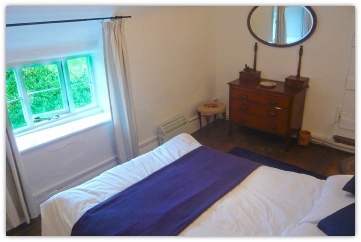 The main bedroom has south-facing windows with fine views across the valley to the Radnor Forest. A second bedroom with twin beds leads off the main bedroom. A third bedroom with a double bed faces west. A bathroom upstairs has a shower, bath, basin and WC. 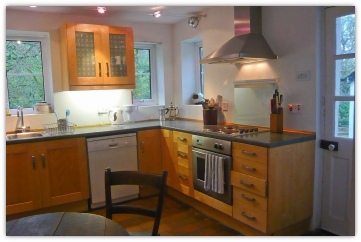 The roomy kitchen is fully equipped with a built-in oven and hob, fridge/freezer, microwave, dishwasher and washing machine. It has lovely views on three sides, and is accessed from a slate-floored breakfast room. The enclosed shared garden has a large lawn. Through a gate in the fence, a footpath leads through meadows and woods. It's old - the current house is some 300 years old, and seems to be developed from an even older medieval building. Got a question? You can find answers to some common questions on the Accommodation page.